The Langdale Chase Hotel, an elegant country house hotel, is idyllically situated for weddings. The hotel is set within three acres of beautifully landscaped gardens, the grounds extend to Windermere and it’s the winner of ‘Best View in Britain’ Award. 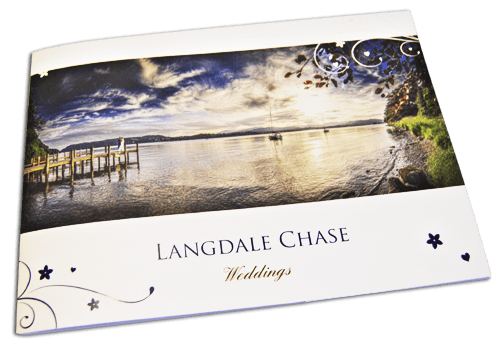 The Langdale Chase commissioned Designworks to create an A4 pack to market their weddings. The landscape format contains 24 stitched pages and a pocket to house additional information. The print finish is a matt laminate and spot UV to outer cover.